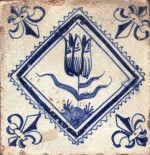 Delftware pottery and tiles were in great demand during the seventeenth and eighteenth century. The term’ delftware’ is generally used to indicate functional or decorative earthenware pottery covered with an opaque white tin glaze on which decorations have been painted in blue or other colours. The term is derived from the Dutch town of Delft where from the seventeenth century many potteries produced hand-painted tin-glazed pottery of high quality which was exported all over the world. 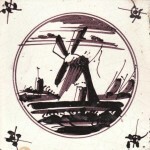 The potteries in Delft produced tiles alongside their other wares but tiles were not a major product. 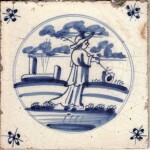 Most Dutch tiles were manufactured in such places as Rotterdam, Amsterdam, Utrecht, and Gouda, and in the north of the country in Harlingen and Makkum where tiles were often the main line of business. Delftware was also made in Britain, at first by Flemish and Dutch potters who had settled mainly in London at the end of sixteenth and in the seventeenth century. However, no specialist tile factories were ever established in Britain and tiles were only one aspect of their output. 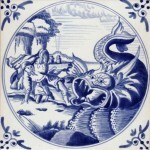 Delftware tiles form a special category within the history of delftware pottery. Since they were mainly applied to walls and fireplaces, they belong to the history of architectural ceramics. Their prime purpose was functional but the many scenes and decorations painted on them have made them a fascinating field of study, which is one reason why they are now eagerly collected or carefully preserved in situ.